﻿ Parker Penography Parker "19"
he concept of a cartridge in a fountain pen to make filling it fast and easy was an idea that had been around in different forms since the late 1800's. Even back in the eyedropper days Parker had experimented with a more portable ink supply, other than the travelling inkwell. Back then the solution was a tablet of concentrated ink, to be dissolved in water but it was the French sister company of Waterman, JIF-Waterman, who first in the 1920's managed to produce a cartridge that proved to work very good — although Eagle had dabbled with the same thing years earlier. This first cartridge was however made in glass and subsequently it broke easily and never really took off in the US, although it became quite popular on the European continent on account of it's obvious simplicity. During the 1940's most companies were looking into the new invention, the ball pen, and some companies, like Eversharp, began manufacture a ball pen with a cartridge filler, the CA, so called because it used a Capillary Action. These pens were however short lived and the cartridge was not very well designed. This pen actually led to the demise of the Eversharp pen company in 1957. he first truly functional cartridge for fountain pens was made in plastic, in appearence similar to the ones we are used to see today, and this time around it was Waterman in the US who began offering them around 1953. Unfortunately for latter day collectors the Waterman CF cartridges are quite different to the modern ones and if You want to use these in vintage pens, You have to find an equal vintage cartridge and painstakingly fill them with a syringe. Parker had put an incredible lot of money and thought into developing new filling systems, first the vacumatic filler and then the Aerometric filler and was hesitant to convert to non integrated filling systems of their own. They had also had a short lived experiment with a cigarette lighter called the Parker Flaminaire (1950-1952) that contained a replacable cartridge of liquid lighter fluid. Unfortunately these cartridges could not easily be refilled, which soon rendered the discontinued lighter useless. Parker had many complaints from dissatisfied customers that had paid good money for a lighter that would no longer work. Parker decided to learn from that experience and when they later on decided to produce a cartridge it was destined never to change. You can take any Parker cartridge from any time period and stick it into any cartridge Parker pen and it will fit. Simple, but very customer friendly. A 1961 Parker "19" CT, made in Canada. ne of the last fountain pens that Eversharp had designed was the somewhat strange Eversharp "10 000" (said to refer to the number of words one cartridge could handle). 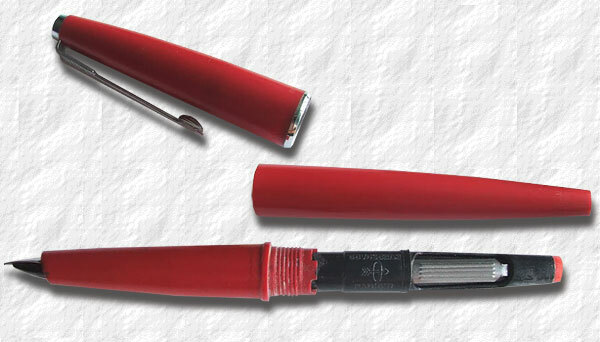 It was slim, with a tapered end and had a short metal cap with a square clip, marked with the Eversharp E. But at this time it was becoming increasingly clear that Eversharp would not make it as a pen producing company and the pen making part of Eversharp was sold to Parker in 1957.
es, the concept of an easily replacable cartridge was attractive. Based on the aquired Eversharp patent Parker began producing plastic ink cartridges already in 1957-58. They sported the dual inscription "Super Quink — fits Eversharp and Parker". Some say that the cartridge patent was the main reason for aquiring Eversharp, although Parker decided to take it one step further. Why force the customer to choose between cartridges and ink bottles? Parker constructed a removable, refillable ink converter that would fit into the new cartridge pen. in 1958 Parker decided to try the new cartridge in their top Parker "51" line. This was highly unsuccessful, probably because it's disposable features somehow lessened the status of owning a Parker "51". The cartridge Parker "51" was abruptly discontinued in 1962. But before then Parker had decided on a new strategy. Parker did continue the production of the Eversharp "10 000". It was sold under the Eversharp brand name but had the additional Parker logo engraved at the bottom of the cap. Die hard collectors does not however consider this pen a true Parker. onald Doman, the designer extraordinaire that worked for Parker on many of its models (the Jotter, Parker "61", Parker "VP", Parker "75", Parker "T1" and Liquid Lead — he also designed train cars for Pullman, tools and bathtubs) had already been drafting on an entirely new concept of a school pen. Not wanting to differ too much from the prize-winning design of the then milk cow Parker 51, Doman initially kept the metal cap and the arrow clip and adopted the stylized clip of the Parker 21 Super, introduced in 1956. He also borrowed the tapered body from the Eversharp "10 000" creating a slimmer and lighter pen than the predominent Parker 21 and 51. Since it used cartridges, Parker named it the Parker "45" after the western revolver. The first Parker "45's" had a completely new kind of steel nib. It was triangular and very small, compared to prior Parker nibs. The complete nib/feed could be unscrewed and easily replaced and many styles of nibs were offered. The patents showing the Parker "45" nib, collector and the converter was filed in 1960 and states Homer T. Green as the inventor. The new pen was introduced in 1960 and was sold alongside the Eversharp "10 000". A 1961 Parker "19" GT, made in Canada. ince the Vacumatic there hadn't been a Parker pen with a plastic cap and Parker wanted to compete on the low priced markets but by this time most plastic parts was being manufactured in a molding machine with difficulties and Parker was having trouble mass producing cheaper plastic pens. Parker had been working on a process to speed up the production by using a new manufacturing technique, constructing the whole pen from the same dye. The process was first tried out in the plant in Canada, using the basic features of the Parker "45". The result, Parker "19", introduced in 1961, was a decidedly cheaper pen. It lacked the metal body ring, it didn't have the black ring that made up the easily exchangeable nib/feed combo of the Parker "45" and it had a steel nib. It was offered in the standard colours of black, red, green, dark blue, light blue and grey, although other colours might have been part of a test production. Also demonstrators has been found. Later pens also came with gold filled trim and a gold nib. It had the additional cap engraving. The Parker "19" was 140 millimeters long. First year pens didn't have a replaceable nib/feed unit. here was also a sister pen to the Parker "19" produced under the Eversharp name, Big E, they are virtually identical, save for the clip, imprints and the section being a tad smaller close to the nib. The Big E was made from the same plastic as the Parker "19". Both pens priced at $2.98, $5 for a ball point/fountain pen set set. 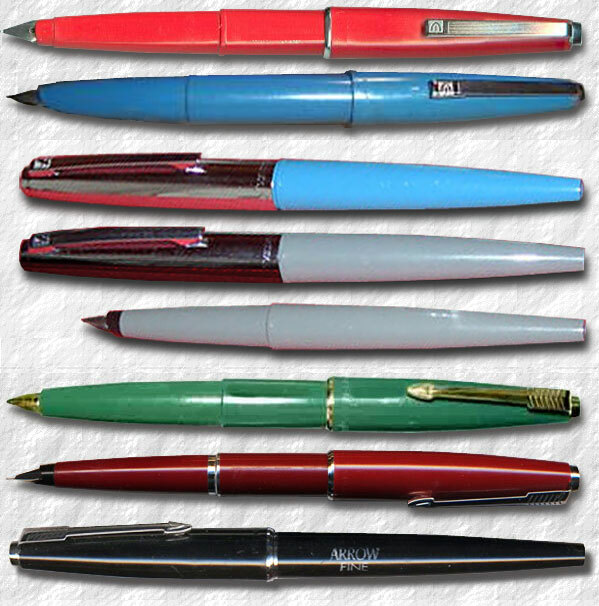 The Parker "19" was trademarked in 1961.
efore the Parker "45" the Parker pen company molded their plastic parts in plunger-type injection molding machines. The plastic was bought as small pellets which was fed into a cylinder where a plunger forced the plastic into a melting chamber where it was forced against the walls while heated until the plastic became fluid. Then the plastic was injected through a nozzle into the mold. The main problem was that the plastic melted unevenly, the plastic closer to the heated walls simply had a higher temperature than the plastic further away. There was also problems with the reduced pressure at the nozzle, which limited the complexity of the molded parts. There was also the added problem with purging old coloured plastics before being able to produce parts in new colours, wasting huge amounts of plastic. It took the workers at Parker four to five hours to clean the machine sufficiantly to be able to change colours. round 1956 German molding engineers had begun experimenting with ways to eliminate the faults of the plunger-type molding machines. They came up with a technique of using a large screw to obtain a constant flow of plastic through the heating system and into the mold, it had the additional advantage that the plastic was kept constantly moving which rendered a more even temperature. Furthermore the changing of colour now took ten minutes and left almost no discoloured plastic waste. Also the need for high pressure was diminished and thus more complex parts could be molded. and a red and a black 1962 Parker "45" GT Arrow. arker bought their first new molding machine in 1962 and within a fw years the old plunger machines were phased out. In 1962 the first official Parker since the Vacumatic to wear a plastic cap in the US was announced, it was a Parker "45", now sporting a 14-karat gold nib. It sold at the astonishingly low price of $3.95, including five free cartridges and sold bubble packed to a card. It was pronounced to be aimed directly to the then 22 million young people in high schools and colleges. At the same time both Parker "19" and the Eversharp Big E was refashioned to incorporate a replacable nib in the fashion of the Parker "45". This was sold with a free cartridge and new converter, which ordinarily cost $0.49. Later a felt-tip version called Tip-Wic was introduced in the mid 1960's. A plastic capped companion to the Big E, the Eversharp Challenger, "Will challenge competition" was also introduced at a meager $1.00. With two free cartridges it was also sold bubble packed to a card. Colours offered were: black, red,deep blue, grey, green and light blue. Furthermore in 1962 the Eversharp "10 000" cartridge pen, which sold for $1.98 also with two free cartridges, as a promotion was offered with an additional coupon which allowed for a refund of $1.00 together with the two used cartridges. Colours offered was black, red, blue, grey, green and white but it was clearly running out of speed. he Parker "45" of course became very popular, the novel filling system was soon in demand and it was eventually applied to other Parker models, such as late models of the Parker 61, the Parker 75 and many other subsequent models. Today no Parker pens are manufactured with an integrated filling system. 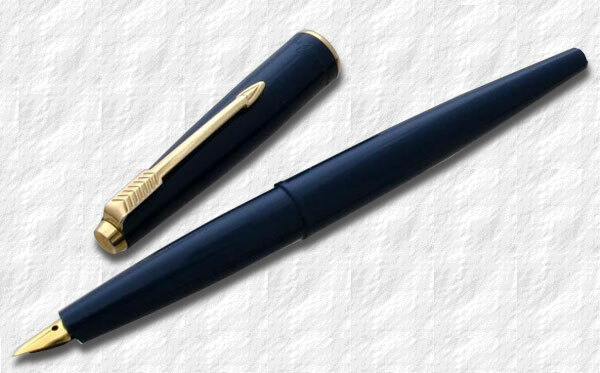 The Parker "19" is by all means a cheap Parker, significant only because it's rather rare, with only a one year+ run, perhaps with an added value as a curiosity to the Parker "45" collector and, of course, in pen history. It was phased out in 1963.